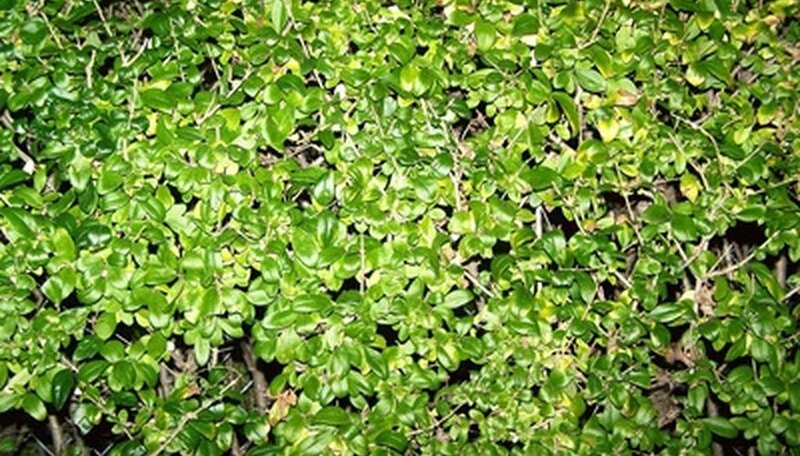 Privet is a genus of evergreen shrubs or small trees. A privet may be left to its natural, upright cup shape or sheared into various hedging forms. Tidying pruning should be done throughout the year to keep the plant healthy; but any significant pruning should be conducted in the winter at the end of the year or in early spring before new green growth sprouts. Remove any cracked, broken or otherwise damaged branches throughout the growing season when you come across them during regular inspections of your privet. Cut away any dead foliage and branches back to a point of healthy wood and compost or discard the cuttings. Create or maintain hedge, topiary or another formal shape in your privet. Shear the surface of the plant using long sweeping movements while holding the cutting blade roughly parallel to the plane of the plant surface. Conduct shaping in the spring and, if required, a second time at the end of summer or in early fall. Restore and revitalize privet that has suffered significant damage from weather or simply from long term neglect by more severe pruning. Remove all of the dead wood and plant material in the center of the shrub. Cut back severely damaged wood to a healthy point, but minimize the amount removed to preserve some the the shrubs natural form. Remove no more than one-third of the bulk of the overall plant in order to prevent stress and the onset of shock. Prune the 'Cheyenne' privet after the plant has bloomed. The shrub produces white flowers in early- to mid-summer, and should therefore be pruned in August or September. Remove dead wood first. Any branches that are gray and brittle, as well as those with no leaf growth should be removed. Trim back branches that extend up or out beyond the natural shape of the shrub. Also remove branches that are sickly, or have yellowed leaves. Give the shrub a tapered shape, with the bottom slightly wider than the top of the plant. This shape helps the shrub withstand high winds and the weight of heavy snow. Cut a template out of thick cardboard, to help give the shrub a uniform shape on all sides. Hold the cardboard up to one side at a time, and trim the 'Cheyenne' privet according to the template. Prune just one side of the privet at a time, if the shrub is used for privacy. When you prune back the branches, you also remove leaves and this will leave that side bare. Pruning all four sides at once will leave the shrub completely bare. Wait until new leaves emerge before moving on to trim other sides. Prune privet hedges in spring and fall. You won't get a formal, clipped hedge look with privet hedge, but you can keep them in a neat, well-rounded shape by going out in early spring and again in late fall with a sturdy pair of hedge clippers. Trim off any branches that look dead, diseased or weak, then trim for shape. Cut back overly long branches and trim off lateral branches where the hedge looks too crowded and messy. Watch for invasiveness. As privet hedges maintain healthy growth, you'll see lots of new shoots around the base of each shrub, which can (and will) develop into large shrubs themselves if given the chance. Remove young shoots, unless you want to fill in an empty space. Space out nearby plantings. Try not to plant anything very close to a privet hedge, both to give the hedge room to grow and breathe and to protect nearby plantings from being overtaken by the privet. You also need room to get in there and prune as needed, so don't crowd out your room with tender flowers or small shrubs that will be injured. An exception would be a sturdy groundcover, which can grow near and even under the privet and endure some tramping without adverse effects. The growth rates vary depending on the species within the ligustrum family. However, the common privet (Ligustrum vulgare) grows about 18 inches per year and is representative of the ligustrum family. That growth rate occurs under ideal growing conditions. The common privet matures to about 15 feet over the course of about 10 years. The glossy privet can grow as tall as 40 feet. The glossy privet is more commonly grown as an ornamental tree, while the common privet is often used as a hedge or border planting. Maximum mature size is reached only under ideal conditions. The ligustrum family of trees and shrubs thrives in full sun although it will tolerate some shade. The plant requires adequate water and is not considered drought tolerant in most conditions. The tree does well under hot conditions and is hardy to about zero degrees Fahrenheit on the other end of the temperature spectrum. The ligustrum plant can be pruned to a shrub or hedge shape or, by clipping low branches, shaped to a tree form. The plant has an attractive gray trunk with green leaves. The plants produce small white flowers in clusters that develop into small fruits that are dark blue to black and poisonous. Clear an area of grass, weeds and debris that is located in full sun to partial shade. Without the competition of other plants, the privet will establish its roots more easily. Loosen the soil to the depth of 24 inches with a shovel. Break the soil clumps up with the edge of a garden hoe. Keep working until the soil texture is as fine as pebbles. Dig a hole as deep as the root ball and 6 inches wider. Remove the privet from its container and gently spread its roots with your fingers. Place the privet in the hole so it is as deep as it was planted in the container. Fill the hole halfway full with soil and pour a bucket of water around the roots. Finish filling the hole with soil and firm it around the privet plant. Plant the rest of your privet bushes by spacing them 2 feet apart for a formal hedge or 4 feet apart for an informal hedge. Water the soil around the plants until wet. Trim the newly planted privets into the shape you want with pruning shears. The scientific name for weeping Chinese privet is Ligustrum sinense cv. Pendulum. Hardy to USDA zone 7, weeping Chinese privet prefers full sun or partial shade and various soils. The plant has a pendulous, growth habit, meaning its branches grow downward, giving it a "weeping" appearance.